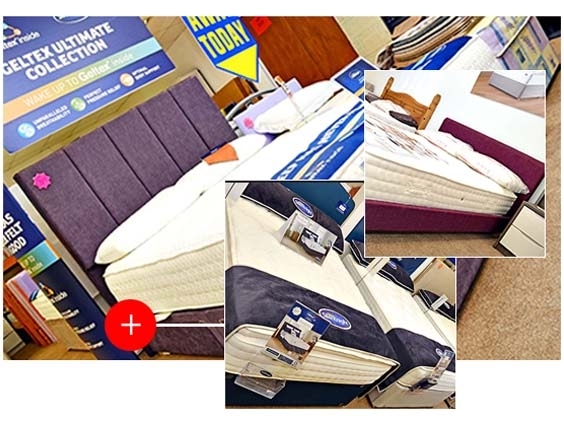 At Carpet Smart, we’ve teamed together with the UK’s biggest manufacturers to bring you an exciting range of beds and mattresses from our five branches in Beckenham, Charlton, Crawley, Welling and Maidstone. Each of our branches showcases the latest products from Silentnight, Rest Assured and KozeeSleep. Our beds and mattresses include the luxurious Geltex Collection, the sumptuous Diamond Range and the ever-popular Classic and Eloquence lines. Each of our outlets has a full range of beds and mattresses in-store, ready for our customers to view and try out. Carpet Smart also have a great selection of accessories to choose from including headboards. We have beds available with wooden frames or metal frames and each of our showrooms has children’s bunk beds on display. From a master bedroom to spare and box rooms, we have everything needed for a perfect night’s sleep. Carpet Smart is also a leading local stockist of memory foam, pocket-sprung, latex and Miracoil® mattresses.